Email newsletters and marketing campaigns are considered to be a low-cost, effective way to reach your audience, making it a no-brainer for many brands. However, as inboxes fill up, email fatigue can set in and members of your audience may wish to unsubscribe. No marketer wants to see the email list they worked so hard to build shrink, but mishandling the unsubscribe process can have dire consequences on your brand’s reputation and bottom line. For starters, your company could be fined (up to $41,484 per violation), as outlined in the Federal Trade Commission’s (FTC) CAN-SPAM Act compliance guide. Use accurate header information and subject lines. This means the “From,” “To,” “Reply-to,” routing information, and subject lines should accurately reflect what’s in your email. Essentially, don’t try to trick recipients into opening the message. Provide a physical postal address. Provide a clear way to opt out of receiving future emails. Process opt-out requests for at least 30 days after the email was sent and honor those requests within 10 business days. Monitor third parties that may be handling your email campaigns on your behalf. Both the brand whose products or services are being promoted as well as the third party can be held legally responsible. How hard is the FTC cracking down on offenders? Let’s just say, more likely than a fine are email deliverability problems. “A simple fine from the FTC is not what’s going to get you. It’s when you cannot get any of your mail to people that may actually want it,” warned Phelan. What it means to get flagged as spam. In addition to the legal consequences of ignoring proper opt-out procedures, you may also find your open rates (and by extension, revenue) plummeting as recipients turn to their email client’s “report spam” button. When a recipient flags your communication as spam, Google says that it receives a copy of it, which it may analyze to protect others. That means that, over time, more reports might land your brand in the spam folder instead of in front of your audience — and, since “out of sight” often equates to “out of mind,” your email campaigns may become less effective and your brand less relevant. An email subscriber can opt out on good terms and provide you with actionable insights as to why they want out, or they can flag your brand as spam. Address the points below in your opt-out procedure to guide them to the former. Provide an “opt-down” option. 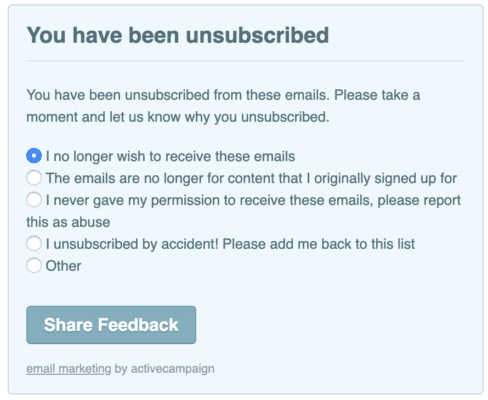 Unsubscribing doesn’t have to be an all or nothing proposition. Consider giving users other options. “By giving recipients the opportunity to dial up or dial down the frequency and cadence of emails they receive, they can literally tailor the mail flow to their needs thus decreasing the likelihood that they will unsubscribe and report spam,” advises Len Shneyder, VP of industry relations at SendGrid. Clothing brand Bonobos is one example of a brand that does a great job of giving users other options. It can then tailor (and measure) campaigns for audience segments based on their interests. And, remember, you still have to include a one-click option to unsubscribe to all your emails. The example below from a different company takes giving users options to an extreme. 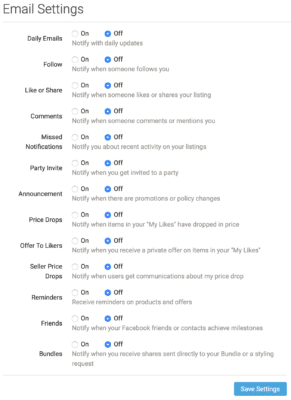 Users may be more inclined to hit “spam” than go through all of these options. A user who is growing apathetic towards your emails may find it more convenient to click “report spam” once over selecting 13 “off” buttons. In this particular instance, they’d still have to remember to save settings. Ensure that your unsubscribe link is safe. 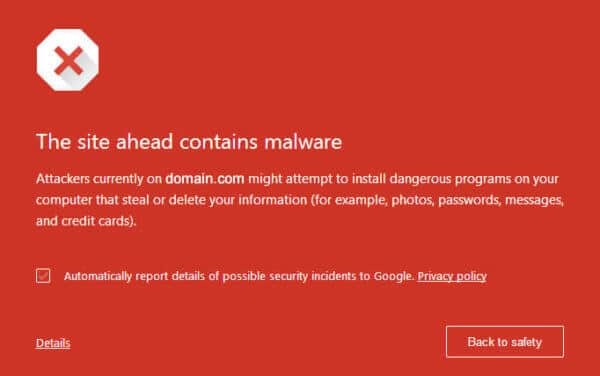 All your links should be safe and you should have an SSL certificate. If you don’t, and your opt-out link directs people to a page like the one below, that may cast doubt on the legitimacy of your brand as well as drive recipients to mark your messages as spam instead of risking a security breach to unsubscribe. Make sure your opt-out isn’t getting snipped. Gmail clips messages that exceed 102KB. If you’re sending messages bigger than that, Gmail will simply show a “Messaged clipped” notice and link to view the entire message. When this message shows, your email doesn’t, and that includes your unsubscribe links and even tracking to register email opens. Gnail will clip email messages that are too big. Keep in mind that the “report spam” button is located at the top of most email interfaces, while unsubscribe links are generally in the footer of an email. Which one is more easily accessed? This is an example of what Gmail does when emails get too long. Find out why they opted out. “Whatever the way in which you enable unsubscribes, be sure to set a baseline, measure and track unsubscribes over time as those trends can be signals of poor content, poor targeting etc.,” said Shneyder. An opt-out is an opportunity to gather data you can use to improve your content marketing efforts. First and foremost, the example above lets the user know that they’re no longer subscribed. Then it provides enough options to inform the marketer without overwhelming the user. It also provides an accidental un-unsubscribe options for users to re-subscribe. Proactively remove disengaged subscribers. If recipients aren’t opening your emails, then they’re definitely not clicking through to your site. That can skew your click through rates and impair your email deliverability. You can get more accurate metrics by removing subscribers who haven’t opened your emails or engaged with your brand in a long time, exactly how long will depend on your industry. Ironically, you should email recipients to let them know they’ve been removed from the list due to inactivity. Lead with a clear subject line and provide a link to opt back in. Remind them why you’re a match. We know users are inundated with email, so much so that sometimes they don’t remember signing up. Remind your recipients in your email header or footer how and when they opted in to receiving your emails in the first place. Then there are the cases when users don’t want to opt out, but want to get your emails sent to a different account. Perhaps they’re switching jobs or have a separate email for newsletters. Provide a link in your emails for users to easily change their email addresses. Following these practices can keep you off spam lists, ensure you don’t run into deliverability issues, generate audience segments for more effective messaging, and above all, keep your email efforts profitable.